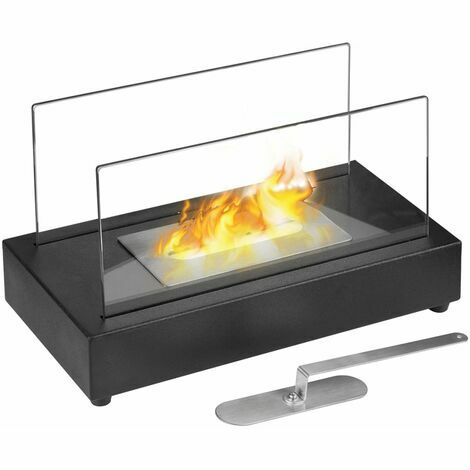 With this tabletop ethanol fireplace FFB 105 from Qlima, you can immediately start a cosy fire so you can enjoy the outdoor life on your patio or in the garden into the late hours! Place the mini fireplace on your garden table or the coffee table and everyone will enjoy the playful fire and the atmospheric light. You can easily and safely ignite this modern freestanding fireplace with a lighter. Its tempered glass safety walls resist temperatures of up to 300°C and/or sudden temperature decreases. This compact fire pit is ideal for decorating your garden and adding some atmosphere and warmth night, but also as an eyecatcher for your living room. Thanks to its modern bioethanol burning system, this fireplace is smoke free, with no odours or fumes, no sparks, no ash. There is no need for complicated seasonal maintenance. The Qlima FFB 105 fireplace has been designed to heat a single room, as it is equipped with a fuel chamber with a capacity of 500 ml, and it has a burning time of 135 minutes. This burner was developed with ease of use in mind, as filling the tank with fuel can be done in a minute and with minimum efforts. Please do not leave fireplaces unattended and do not allow small children to manipulate them.